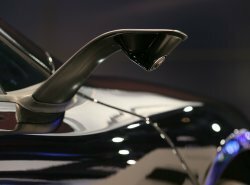 McLaren Automotive and JVCKENWOOD unveiled today an innovative design study, the McLaren 675LT JVCKENWOOD Concept, created for the CES® 2016 consumer electronics show in Las Vegas, Nevada. The Concept is based on the new McLaren 675LT Coupe and features a host of new technologies and celebrates the 25th anniversary of their Formula 1™ partnership. For its collaboration with JVCKENWOOD, McLaren began with a 675LT Coupe prototype vehicle. The 675LT Coupe, which recently went into production at the state-of-the-art McLaren Production Centre in Woking, England, is the most driver-focused, lightweight and aerodynamically optimized model in the McLaren Super Series family. Strictly limited to 500 units, all sold out within a matter of months. 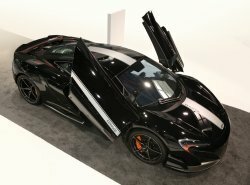 The McLaren design team, led by designer Peter Wilkins, was tasked with incorporating the JVCKENWOOD CAROPTRONICS system into the 675LT Coupe. Working closely with JVCKENWOOD’s Japan-based team, they focused their attention on the interior of the 675LT Coupe. The interior of a McLaren road car is a purposeful and minimalist environment and, with its emphasis on weight savings, the 675LT Coupe is one of the most extreme of all. This made it the ideal starting point for the McLaren 675LT JVCKENWOOD Concept. To incorporate JVCKENWOOD’s technology, the team created a layered and panoramic yet purposeful interior using a mix of classic McLaren materials and innovative new fabrics. 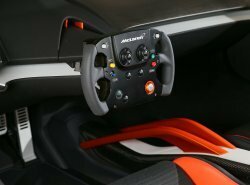 The result is still recognizable as McLaren, but takes interior design a step forward. The already dramatic exterior of the 675LT Coupe is little changed. Key functional differences are the door-mounted rear view camera blades and third camera mounted above the rear number plate with its housing painted Palladium Grey. More visible are JVCKENWOOD silver racing stripes that start from the front hood-mounted McLaren badge and continue over the roof to finish ahead of the Longtail Airbrake. For further details on the car visit: cars.mclaren.press.